One difficulty we have in relating to these narratives is that they all happened so long ago, and happened to Bible characters rather than people like us. The High Priest had to decide whether he was face to face with the Messiah, but, being a Bible character, he was too blind to see what was in front of him. Back in 1994, however, we had a chance to be Bible characters ourselves. That was the year of the passing of the Lubavitcher Rebbe, Menachem Mendel Schneeerson, who had been coyly noncommittal about whether he was the Messiah, but some of whose followers said with great assurance that he had met all the criteria for claiming that title. On June 12 of 1994, the Rebbe died in New York, an event that made the front page of newspapers everywhere. And on June 13, two of his closest followers appeared on Larry King Live, affirming that he had satisfied all the requirements for Moshiach Now! Nothing supernatural would occur, they told their audience (Maimonides says that nature remains in its usual course during the Messianic Age). Out in Santa Cruz, California, I listened with fascination and with the determination to look for evidence that the age of redemption was at hand, to be signified not by subjective visions of the transcendent, but by public evidence of the achievement of World Peace, the principal requirement that through the ages has kept the Jewish people saying that the Messiah had not yet arrived. "Death Shatters Jewish Hope for Messiah" read one newspaper headline. Aha! Exactly the headline that would have been written nearly two millennia earlier, thought I. But why not wait for three days and see if there are any signs of redemption which will be visible to all? And on the third day, the New York Times reported that full diplomatic relations had been established between Israel and the Vatican! A two thousand year era of hostility and mistrust had ended! I confess that I got a trifle funny in the head when that story appeared, and even funnier the following day when the Times reported that Fidel Castro had appeared in public for the first time ever in civilian clothes rather than military dress, a sure sign that the prophesy of Isaiah had been fulfilled, that swords were being beaten into plowshares, and fatigues were being exchanged for white guayabera shirts. And on the day after that, when Jimmy Carter went to North Korea to defuse the most dangerous situation in the world in a peaceful and respectful manner, the dots were all connected and the picture was complete. The Messiah had indeed arrived and the Messianic Age had begun! I was off and running (right into the hospital for a seven day mental health hold). Well, I never got any takers to join Christians for Schneerson to seek interfaith dialogue with Jews for Jesus. But I did come away with a question which seems relevant to our world today. Christians have long said that the contemporaries of Jesus did not recognize the Messiah in front of them because they were looking for a redeemer who would impose redemption by military force. My question is: would Christians recognize the Apocalypse (the Unveiling) if it happened with no spasms of violence and no tribulation for countless millions of people? If no one was Left Behind? Maybe some things are best left for Bible characters after all. The third team here are Muslims. I confess I have no idea what a mainstream Muslim apocalyptic looks like. We have a detailed account of the ISIS version, but they are bloodthirsty DIY fundies about as close to representative as the Left Behind books would be of Catholic teaching. If you went to Al Azhar or Ayatollah Sistani, what would they say about the End Times? Depends what you mean by "mainstream", I suspect. I suspect that, like "mainstream" Christians, mainstream Muslims probably don't give it much thought. Doctrinally, though, the Islamic version is much like the Christian one. Total destruction, everyone resurrected, Judgement Day, Jesus returns to Earth to defeat the "anti-Christ", followed by a period of peace, that sort of thing. A bigger question to me is that of Pontius Pilate. He supposedly asked Jesus, "Are you really the King of the Jews?" Jesus replies, "It is as you say." Pilate then supposedly said, "I find no sin in this man." This is truly an extraordinary statement. Jesus has just committed a death penalty offense under Roman law. Since Judea was then a Roman subordinate state, rather than as an allied state during Herod's time, only the Romans could choose the Jewish king. Anyone else claiming the title was attempting to usurp Roman authority, promote revolution, and therefore was taking their life in their hands. So why did Pilate say that he found no sin in Jesus? Robert Graves identified one possible answer in his book "King Jesus" (1946), which can be read as yet another version of the gospels. Perhaps Roman law required an overt act, not just speech? Jesus is represented by John's gospel as explaining that "my kingdom is not of this world", but that is of of doubtful historicity. More important, Pilate was an unscrupulous thug. The hostile biblical picture of his character is confirmed by Philo and Josephus. In the Gospels, he was being manipulated, and knew it. This is a guy who thinks in payoff matrices. The downside of execution is that it gives Caiaphas a win and risks a riot from the Jerusalem mob. The upside is that the execution on the bogus charge of rebellion can be used to reinforce Rome's and his own precarious authority. The INRI episode rings true, as does the objection of the Temple party that Pilate brushes off. New Testament scholar Bart Ehrman has made the argument (which I hope I shall represent accurately) that in fact what Judas' betrayal was about was not Jesus' location or a place where they could find him without (too many) followers, as the Synoptics suggest–the rulers, both Jewish and Roman, could have kept track of that easily enough–but a statement he made to the disciples. It's been a while since I read the article, but it might have been his remark in Matthew 19:27,28 that the twelve disciples would rule with Jesus, sitting on twelve thrones and judging the twelve tribes of Israel. That would be tantamount to an intent to overthrow the government, which would be of great interest to the Romans. If that's the case, then Jesus couldn't have walked it back once Judas had submitted his evidence. It does however make for an interesting dramatic scene: Jesus' moment of decision before the court. As a historian Ehrman's interest is in figuring out what is likely to be real (or at least part of the earliest version of the story) and what might have been added later. 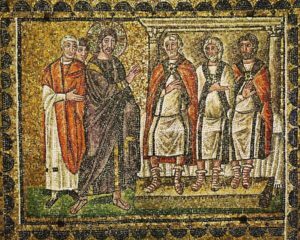 The choice of the "twelve thrones" comment is based on the idea that the early Christians would be unlikely to invent that story as it contains an embarrassing error: the twelve disciples Jesus was promising thrones to included the traitor Judas. Another take on Judas is that he was a believer in the messiahship, and exasperated by Jesus' havering and ambiguities. He wanted to force Jesus into making the claim in public, which he did. Then it all went wrong – no army of angels, no thrones, humiliating and grisly death. So he committed suicide in despair and disappointment. The suicide makes no sense if Judas was merely venal or a caricature villain, in which case he would not have been unduly upset by the course of events. Kind of a side issue, but while the Gospel of John gets a lot of scholarly dismissal, the author was undoubtedly accurate on one key point — the "last supper" was not a Passover Seder, it took place a day earlier. One of Paul's authentic letters indirectly confirms this. Jesus was arrested and tried Thursday night, crucified the next morning, and died before Passover began at sunset. No Jew I've talked to believes that senior Temple Jewish officials would interrupt their own Passover celebrations to conduct a trial and hand someone over to the Romans. I believe all of these eminent 1st century Jewish officials were anxious to have the whole business over with before sundown.